Jose Torres flashes a big smile following is walk-off grand-slam home run. 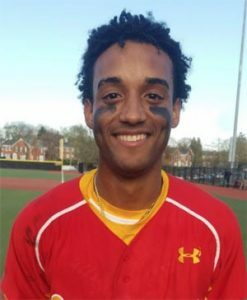 Calvert Hall’s slugging senior shortstop Jose Torres blasted a walk-off grand slam homer in the bottom of the seventh to give the the second-ranked Cardinals a 5-2 to win over the visiting and third-ranked Gilman Greyhounds, Tuesday afternoon at Carlo Crispino Stadium in Towson. The dramatic, come-from-behind victory allowed the Cardinals to remain undefeated in the MIAA A conference with a 10-0 record. “This is the kind of game you dream of,” said the North Carolina State commit, who is also expected to be selected in the MLB draft in June. In his previous at bat in the bottom of sixth, with the Hall trailing 2-1, Torres whacked an extra-base hit, but he was called out at third, going for a lead off triple to start the frame. Torrrs said he hit a high fast ball in the sixth inning and when he came to the plate with the bases loaded in the seventh, he said he looking for a curve ball. “He (Gilman reliever Matt Leikus) kept throwing curve balls, so I sat on a curve ball and put a good swing on it. 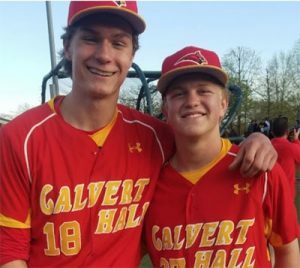 Pete Marchineck (left) made the start and gave Calvert Hall five strong innings and Grant Duemmel got the win in the relief. The Cardinal pair limited Gilman to just three hits. The Cards (15-2 overall) got a break to start the 7th, down 2-1. Frankie Wright led-off the seventh, and during his at bat, he fouled off two pop-ups behind the plate that were not caught, giving the Hall a new life twice in the same at bat. Wright eventually reached base when he was hit by the pitch, to put the tying run on first. Leikus then got Lamar King on strikes, but he walked pinch-hitter Nick Tamberino to put the potential winninig run on first. With runners at first and second, and one out, Gilman coach Larry Sheets summoned Tripp Myers to the mound. Myers walked Garrett McIlhenney, setting stage for Torres. Sheets went to the mound again and brought Leikus back in to face Torres, but the move back-fired. Hall skipper Lou Eckerl said, “I learned a long time ago it’s better to be lucky than good. When they missed two foul pop-ups, I knew that luck was going to be on our side. Sheets, for his part said, “We had our opportunities and we didn’t take advantage of them. We gave them extra outs in the last inning and they took advantage. “I still like to come here. It’s a great place to play. I like our chances this year in the playoffs,” added the former Baltimore Orioles’ slugger. Eckerl used two pitchers, starter Pete Marchineck, who threw five strong innings, and reliever Grant Duemmel, who notched the win. Marchineck and Duemmel held the Hounds to three hits. No. 3 Gilman scored a run in the fifth inning on a fielder’s choice that tied the game 1-1, and they scored again in the sixth inning on a suicide squeeze to go ahead 2-1. Antonio Barranca hit a solo homer for the Hall in the fourth, when the Cardinals took a 1-0 lead. Marchineck did not allow a hit until there were two down in the fourth, but he didn’t realize he had a no-hitter going at that point. “I wasn’t thinking about that,” said the tall lefty. “I just love when my guys make plays behind me. Gilman can really hit the ball, and we have a lot of respect for them”. Calvert Hall will travel to Irvington to meet Mount Saint Joseph on Thursday, and then they will stay on the road next Monday, when they see Gilman (13-8 overall, 7-4) again in Roland Park. Elsewhere in the league, McDonogh defeated Archbishop Curley, 8-2, and St. Joe edged St. Mary’s, 4-3. The Eagles and Gaels remain tied in the league with 7-3 records and both moved a half game ahead of Gilman, which now sits in fourth place. Loyola (5-4) routed St. Paul’s, 18-0, and Archbishop Spalding (6-5) blitzed John Carroll (4-6), 12-2. The Dons lead the Cavaliers by percentage points for the fifth place. John Carroll is now 1-1/2 games off the playoff pace and defending champion Curley is two games out of sixth place. Pictured above: Calvert Hall players mob Jose Torress (not visible) as he crosses home plate following his walk-off grand-slam home run.